Does your personal or work vehicle need an oil change? If you live, work or play in the Cameron Park area, we are your one stop neighborhood spot for oil changes. 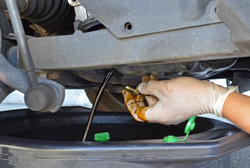 Oil, lubricant, and fluids play an extremely important role in the safety and operation of your vehicle. Oil lubricates and protects various systems and components within the engine. When the oil level gets low, or if the oil’s protective qualities have deteriorated, you often invite serious and expensive breakdowns due to increased friction. Avoid the high cost of an engine replacement by maintaining your vehicle with regularly scheduled oil changes.